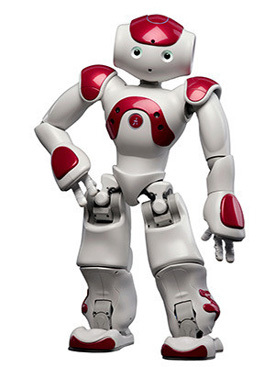 Anyone can build robots that drive around on a tabletop, respond to light and other objects, and have surprisingly lifelike behaviour. 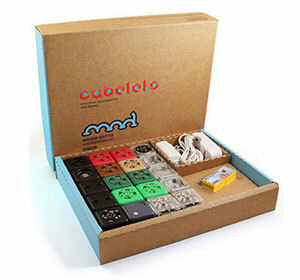 Instead of programming that behaviour, you snap the Cubelets together and watch the behaviour emerge like with a flock of birds or a swarm of bees. 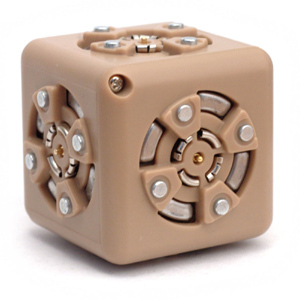 Each Cubelet has a tiny computer inside of it and is a robot in its own right. 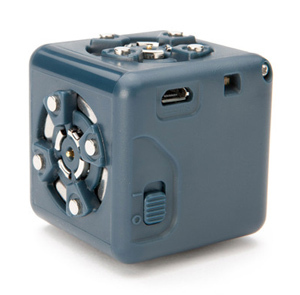 When you put Cubelets together, you’re actually making a robot out of several smaller robots. Each Cubelet communicates with its neighbours, so you know that if two blocks are next to each other, they’re talking. 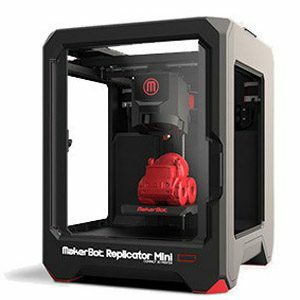 Contains a motor and roller wheels for moving on a horizontal surface. 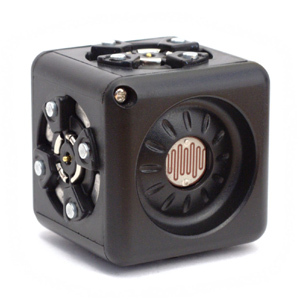 The Drive Cubelet only moves in one direction, slowing to a stop with a value of zero and moving faster with higher input values. One face spins at a rate corresponding to the block’s input values. Chirps according to the block’s data value. Contains a small speaker and an amplifier. 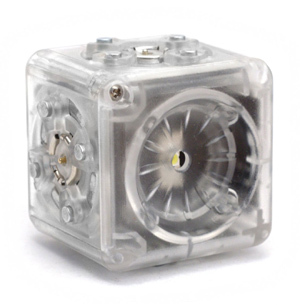 The Flashlight Cubelet emits a focused beam of light from a powerful white LED. Off with a value of 0, the light becomes brighter with higher input values. Displays the block’s value as a light-up bar graph. The value is normalized to the number of points on the bar graph so that a maximum value results in a fully-lit bar graph. 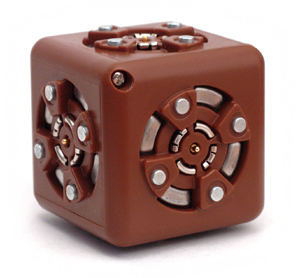 The Knob Cubelet has a potentiometer embedded in one of its faces. It outputs a 0 when turned fully counterclockwise, and a 1 when turned clockwise. Detects the amount of light hitting it’s sensor. 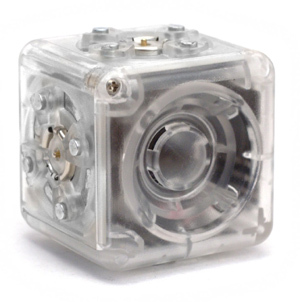 The Brightness Cubelet has an analog photocell that responds to varying light conditions. Expect values near zero in a dark room, and values near one when the sensor is in front of a bright light. 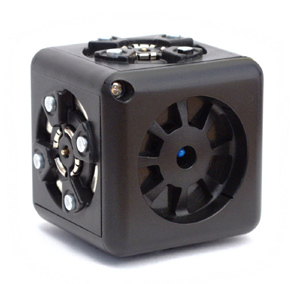 The Distance Cubelet detects how far it is from an object. It uses infrared light and is accurate between 10 and 80 cm. The sensor is directional, so it outputs the distance to the object in front of the sensor. At 10cm, the block will output values near 1, and toward 80cm it will output values near 0. 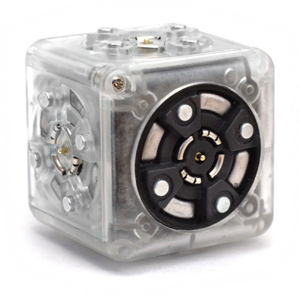 The Temperature Cubelet contains a tiny thermometer (actually, a thermistor) that detects temperature. It’s calibrated to output a 0 in freezing conditions and 255 in hot, sunny conditions of about 35C. 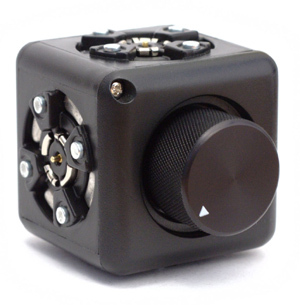 The Minimum Cubelet can accept any amount of data but only outputs the smallest value that it receives. 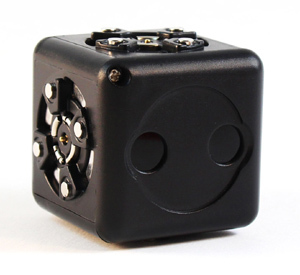 It can be handy for creating an on-off switch for a robot and also for using with a Distance Cubelet to build robots that avoid falling off the edge of a table. The Maximum Cubelet accepts many different inputs but only passes along the one with the greatest value. 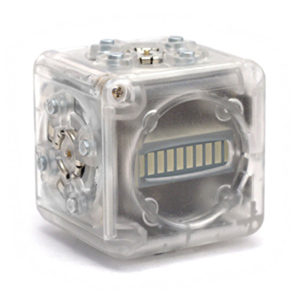 With a maximum block, you could easily build a robot that performs an action only when a sensor reads a value over a certain threshold (set by a Knob Cubelet, perhaps). 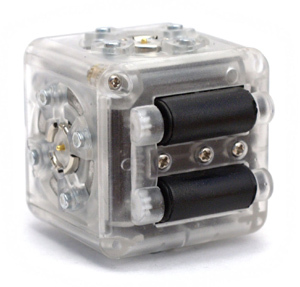 Play longer than ever before with the redesigned Battery Cubelet! 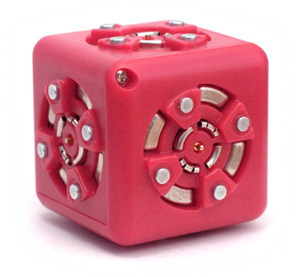 This Cubelet provides the energy needed to make your robots spin, drive and squawk. 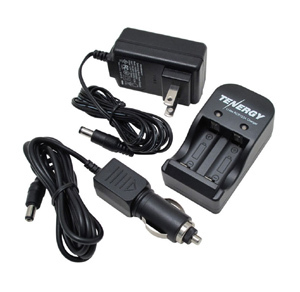 The new Battery packs 30% more power than the previous generation and easily recharges via micro USB. The Passive Cubelet is a basic building block. It carries power and data from its neighbors, but it basically acts like a smart brick. It doesn’t move, sense, or change the data in any way. 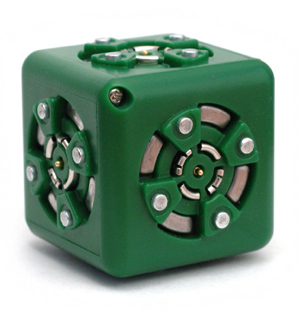 The Blocker Cubelet is a basic building block that “blocks” data from its neighbors. It still passes power, but effectively stops communication and can insulate one side of a robot from another. 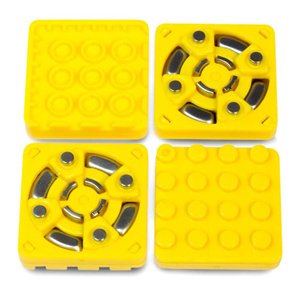 Use these little yellow adapters to connect CUBELETS and LEGO® bricks!